I was sad to leave Little Port Walter and all the marvelous underwater life, but on the bright side we were heading to another new place on Baranof Island’s eastern side that we heard was very dramatic: Gut Bay. The bay itself is pretty large, but the entrance is only about 150′ wide and there, right in the cut was a humpback feeding. Hello – Welcome to Gut Bay! Alaska is a place where superlatives are often lacking and the best word I can think of for Gut Bay is “breathtaking”, which falls short. Steep-to cliffs and tall mountains surround the Bay, particularly near the entrance. It’s difficult to pay attention to navigation between the whale and the scenery, but we soon noticed that the electronic chart (chart plotter) was very inaccurate. 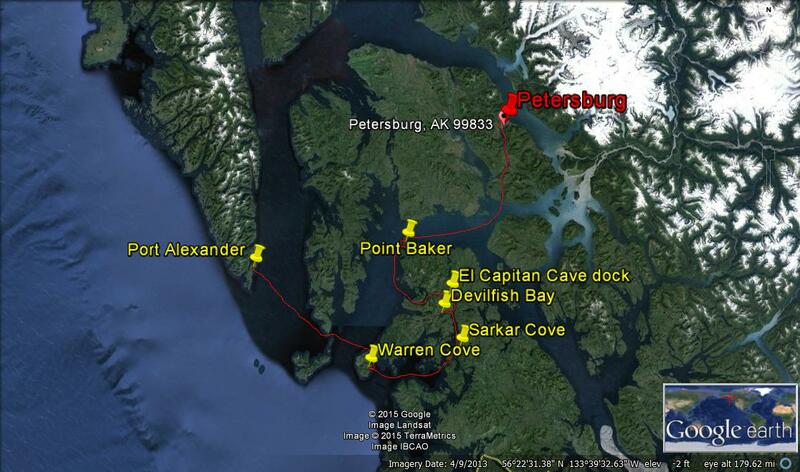 Many of the charts in Alaska are very old and not always correct, and there are still many areas that have not been formally surveyed – this was the case in Gut Bay, particularly at the head. We carefully sounded the anchorage to find a good flat area and clear swing circle – which the chart plotter indicated was dry land! High tide meant it was the perfect time to kayak up the creek at the head of the bay, giving access to meadow and valley with a good number of bald eagles fishing in the streams that fed the creek. 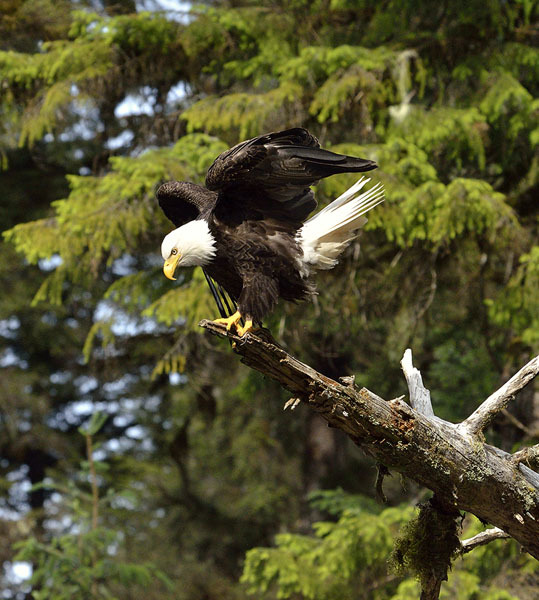 We kept an eye out for bears or wolves, but only saw the eagles and kingfisher, and a seal. 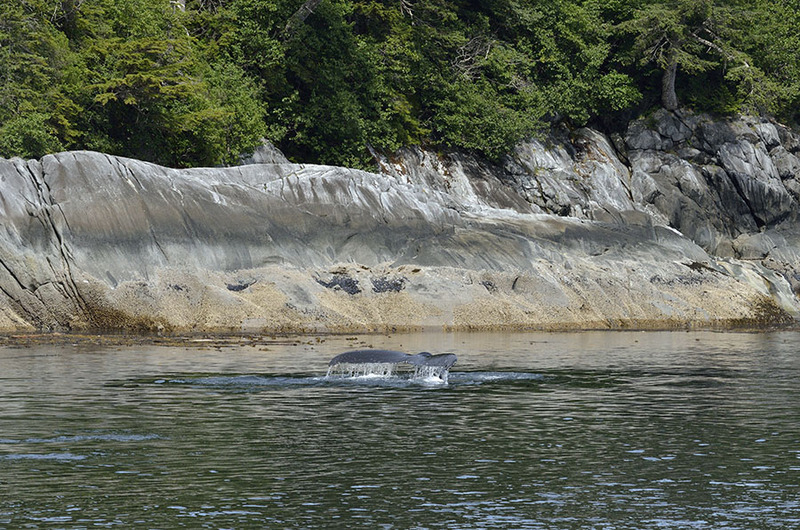 We stayed one night, and as we were cruising out the entrance cut we again saw a whale feeding. It dove before we got to the narrow spot, and re-appeared behind us, with the sound of its blow echoing off the rock walls. Cruising up Chatham Strait we headed to Red Bluff Bay, which was a favorite spot from last year – another really beautiful place. We experienced a “small world” moment when we rounded the corner towards the best anchoring spot and found a friend’s boat just pulling their anchor to leave – hopefully we’ll catch up with them later in the season somewhere. 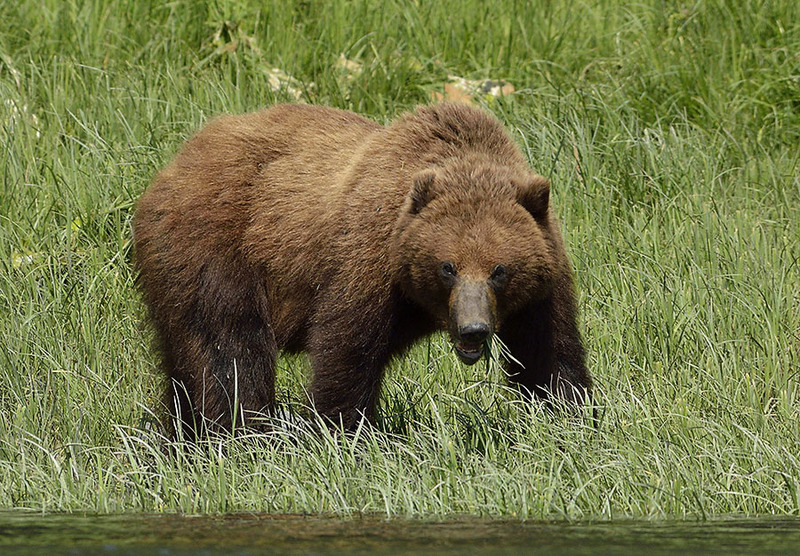 We expected to see bears in the meadow at the head of the Bay, but it turned out to be a Brown Bear Festival! 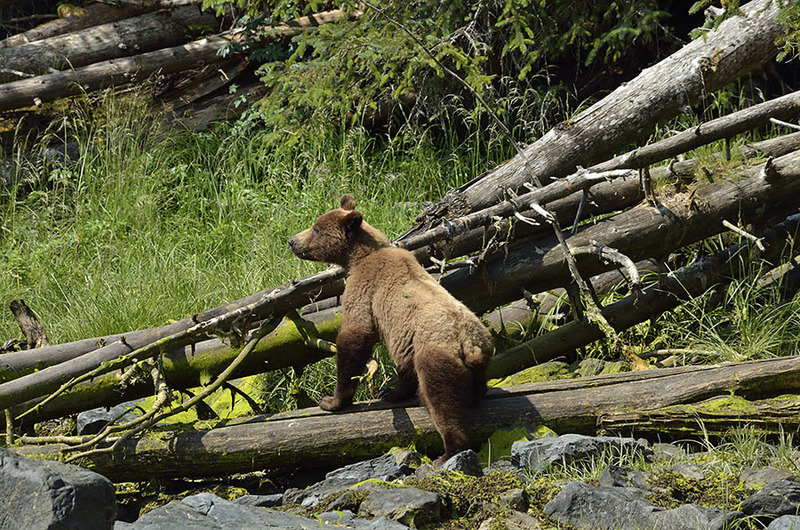 We saw 6 brown bears the first day, and at least that many the second day. On the first day the tide was rising and I jumped in the kayak to explore. The head of the bay is a very long shallows, so the accessible area is much greater when the tide is in. I paddled into a little side area that I hadn’t been in before, and I just sat listening to the birds and drifting. 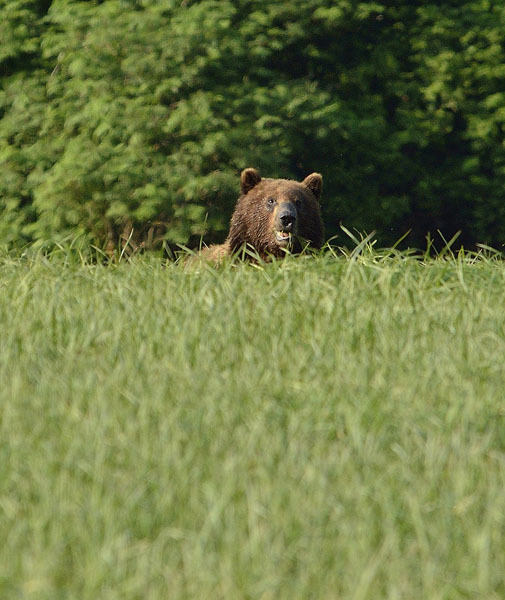 Sometimes I talk to myself, and this was one of those times – I said aloud “wow, this is so beautiful”, and the next thing I know three brown bears pop up from behind a little rise – two of them standing upright, about 75′ away. Excited, thrilled, rattled, scared – I reached for the camera, but by the time I got it to my face the bears had turned around and were running into the woods, up the hill. One of them paused to look back at me… …and I saw one stop and peek at me through the trees as they made their way noisily up the wooded hillside. WOW. Lots of adrenaline for me and those bears. 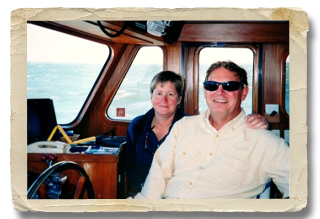 The next day I was working on something in the cockpit and Jim came out and whispered “there’s a bear right behind the boat, on shore.” I grabbed my camera and he got his video and we watched a younger bear forage by the water’s edge, climbing over fallen trees. He had a lighter colored body and dark legs that looked like pantaloons. 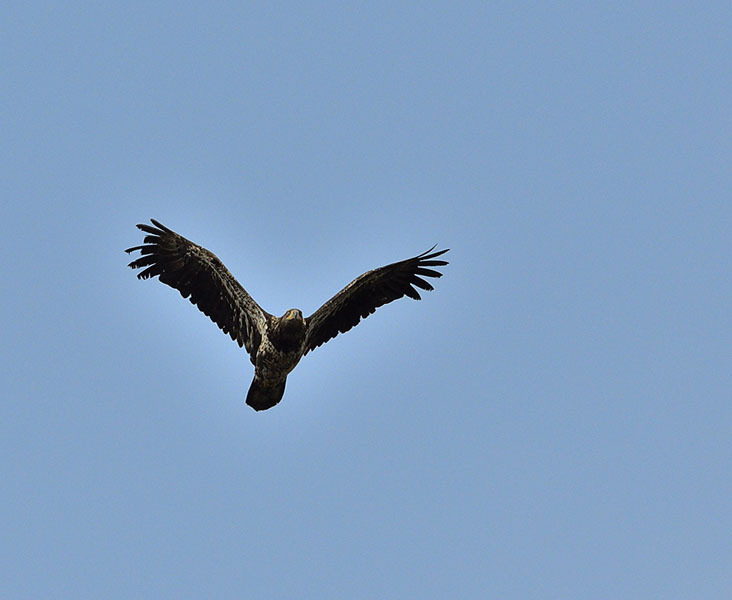 In the midst of watching this bear a pair of bald eagles flew right overhead, escorting their young eagle. Wildlife overload. After a while I got in the kayak to get just a little closer, but I was barely away from ADVENTURES when the bear stopped to look at me, and then ran off into the woods. 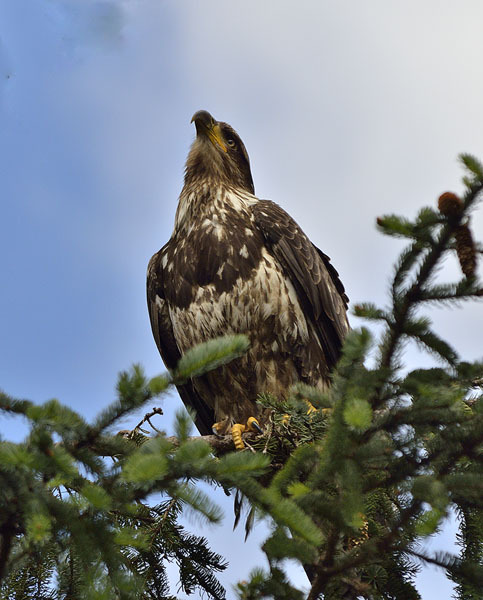 I didn’t mean to disturb him – I was a good distance away, but he was quite skittish. The wind started picking up but since I was already settled in the kayak with cameras I went to check out the “three bears” spot from the day before. 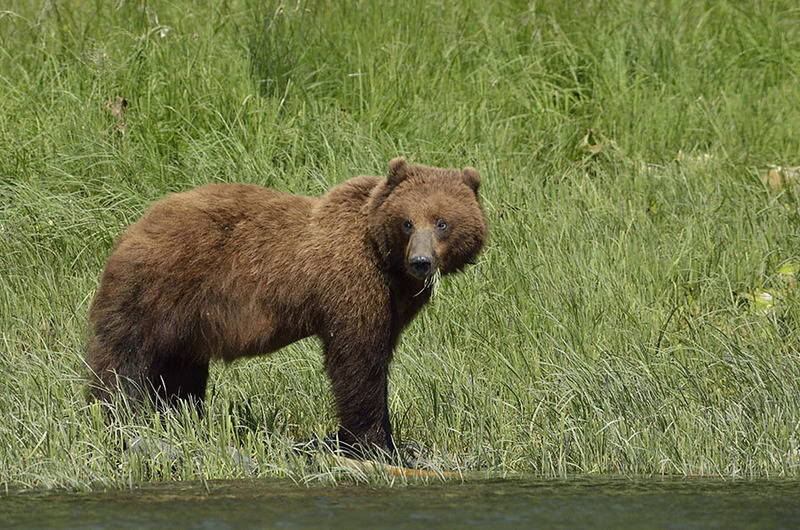 Sure enough, as I rounded the corner there was a good-sized brown bear right on the shoreline. 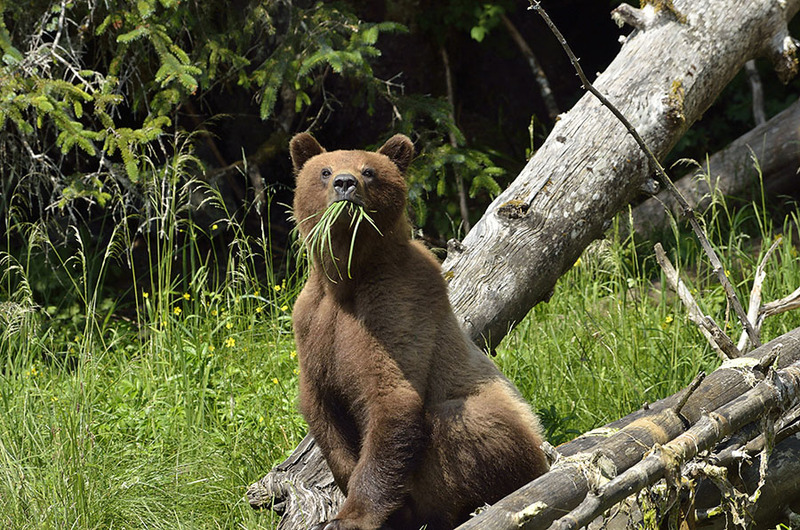 Grass is the bear’s main diet until the salmon come into the streams and berries are ripe. This bear was not afraid of me, but I have a healthy respect for bears so I paddled backwards to give him plenty of space. 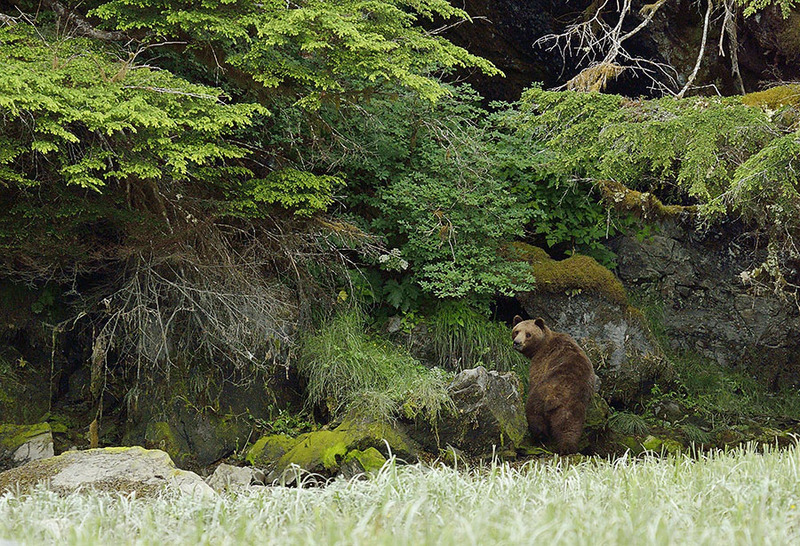 All the bears I’ve watched, with binoculars or at closer range, always pause to look around when they’re eating. He noticed me, but didn’t pay any attention. I typically waited until he was looking at me to take photographs, but he didn’t react even when the kayak made some noise bumping a rock. The bear went about his business, eating his way along the shoreline while I kept my distance, got some photos, and then left him alone. I like this photo because it makes him look mean and angry, but the truth is that I just caught him as he was raising his head up with a mouth full of grass. 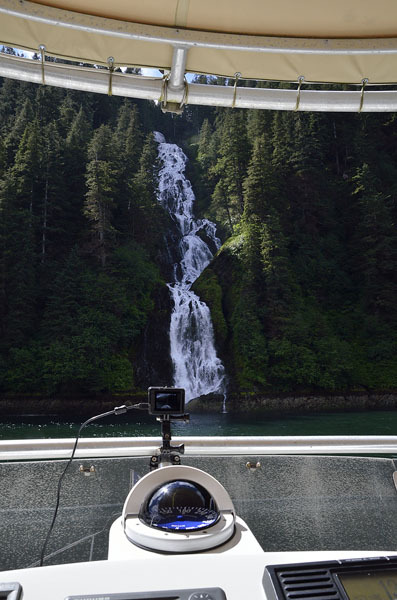 We leave places so we can explore new ones, but Jim recorded some time-lapse video as we pulled up the anchor and headed out of Red Bluff, with a close-up stop at the big roaring waterfall. We call this set-up “ADVENTURES-Cam”. 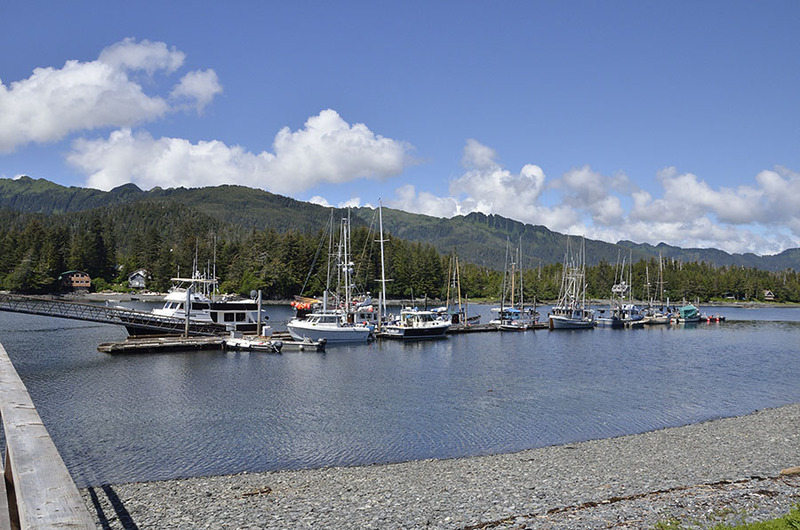 About 90 minutes cruising up the east side of Baranof Island from Port Alexander is a little pocket of a bay called Little Port Walter. It’s very protected, with a n-a-r-r-o-w entrance into an inner bay that’s very pretty. 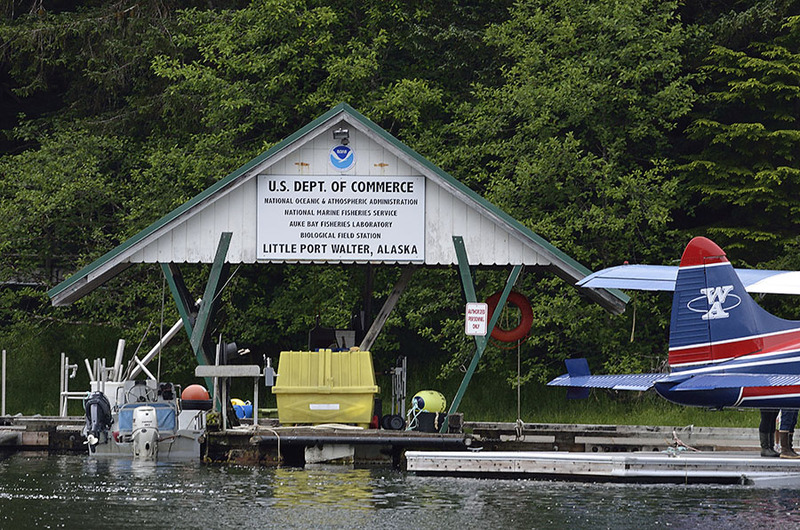 It’s also home to a NOAA Fisheries Research outpost, though we couldn’t figure out much about the kind of research they were doing. 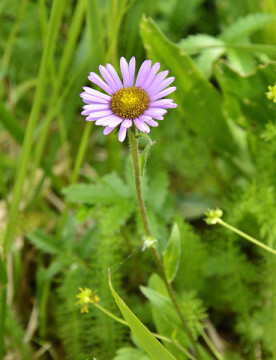 I was paddling around the inner harbor and saw a gal walking along a dirt road. She waved and I waved back, and I chuckled when I heard her clapping and singing as she walked – it’s what one does to let the bears know that you’re a human so they will avoid you. 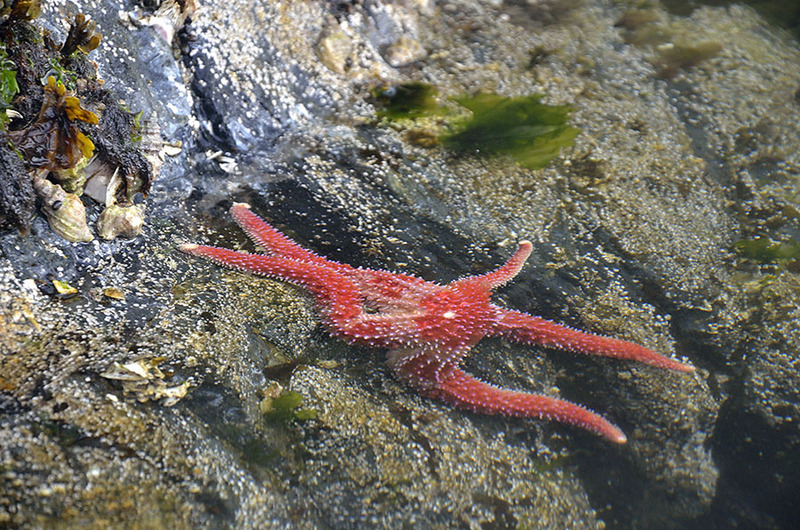 I fell in love with Little Port Walter because of all the marine life – kayaking along the shoreline I saw all kinds of starfish – many-legged sunstars and regular starfish in a variety of shapes and colors… …sea cucumbers, shrimp, anemones – bright orange ones, red ones, plumose, and green ones. I found a tiny nudibranch on a kelp leaf, but I only had a big telephoto lens and couldn’t get far enough away to focus on it. 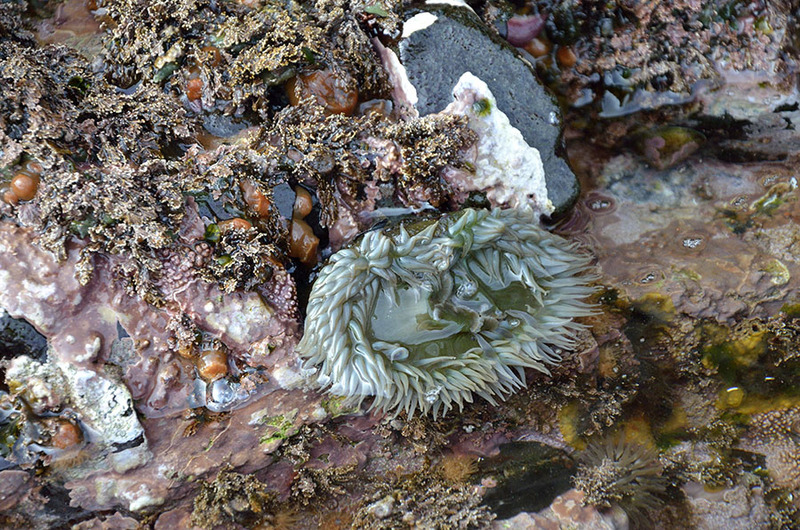 I found a bright yellow fish hiding among other kelp leaves, and some large feather duster worms with burgundy “dusters” on the lee side of some exposed rocks. I saw acorn or eagle barnacles nearly the size of my fist. It was a bonanza! The water teemed with zooplankton and tiny jellyfish. Jim is the underwater video expert, but I borrowed one of his GoPro cameras and took it out in the kayak the morning before we left to try and show you a little of the life at the tide’s edge. Bear with me – some of it is a little fuzzy, but I’m learning. You’ll see a big sunstar, a lion’s mane jellyfish, anemones, a little thimble-sized jellyfish, zooplankton, a sea cucumber (red with orange “spikes”), more anemones, and a shrimp that leaps into view. 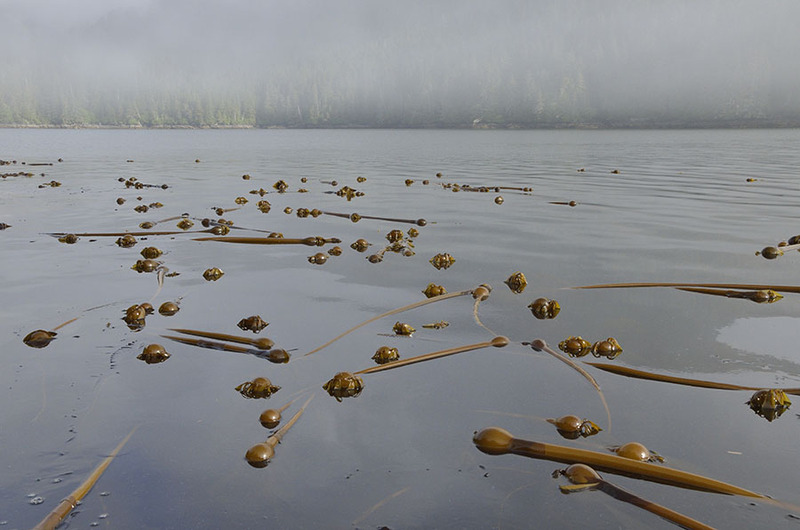 The area had both bull kelp and newspaper kelp – home to a lot of life, and fairly easy to paddle over. Just around the corner, out in Chatham Strait I saw some scoters and this arctic loon, and of course there were mink and plenty of eagles. We want to return and spend some time diving or at least snorkeling here – what a fantastic spot! The last segment of the beautiful El Capitan Passage took us on a winding path through rocky islands and into Sea Otter Sound. 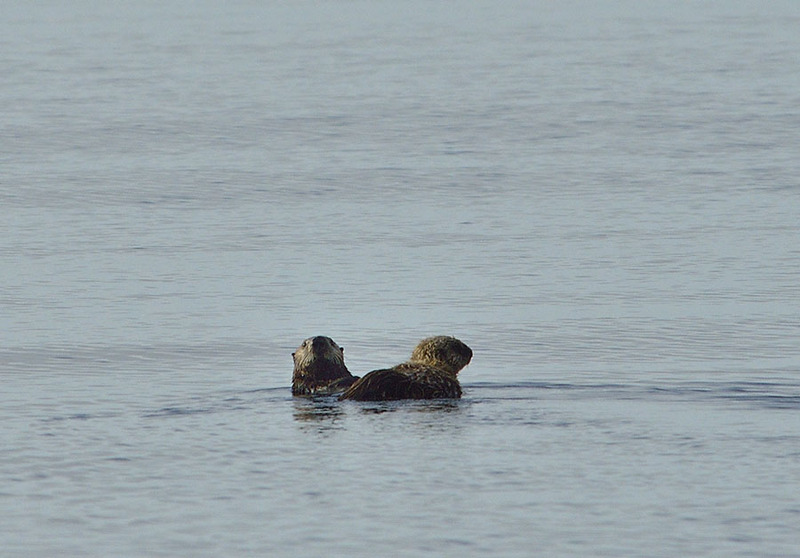 We saw many sea otters along the entire Passage, and we love to watch them – so adorable. 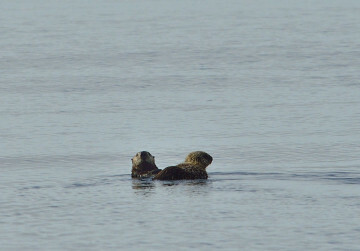 But sea otters are the enemy of fishermen since they prey so heavily on crabs and clams, and they have no natural predators to keep their numbers in check. From Sea Otter Sound we came through a narrowing and out into the open sea – next stop: Japan. We had calm conditions for traveling, but you know you’re in the ocean because of the swell. We chose an anchorage on the east side of Warren Island, but the swell actually wrapped around the island and found us anyway. We experienced the same thing in the Exumas islands in the Bahamas often – like being gently rocked, except that it doesn’t stop! 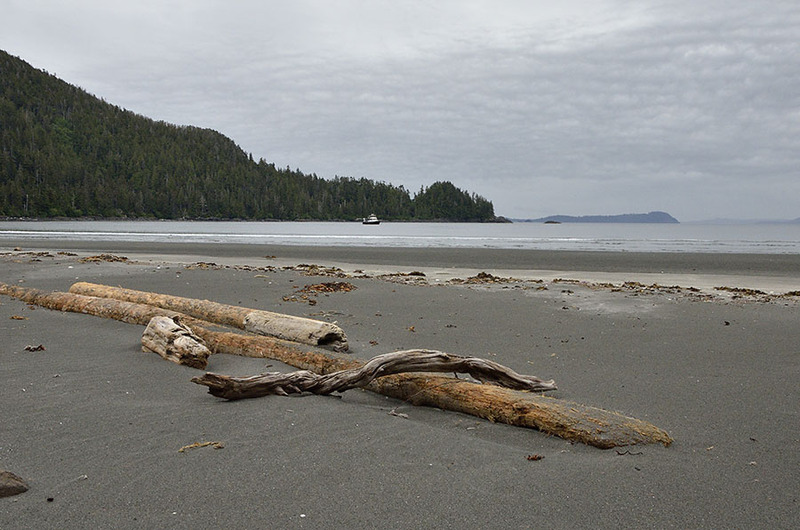 Warren Cove has a huge sandy beach which isn’t very common, so I jumped in the kayak with cameras and bear spray to do some beach combing since the tide was low. Clam shells on the beach were the biggest I’ve ever seen, and I found a few other unusual shells and a glass insulator of some sort. Sadly there was also a lot of plastic trash washed up on the beach – far more than I could hope to carry in the kayak. Some of the trash was fishing related, and about half of that had Japanese writing on it. 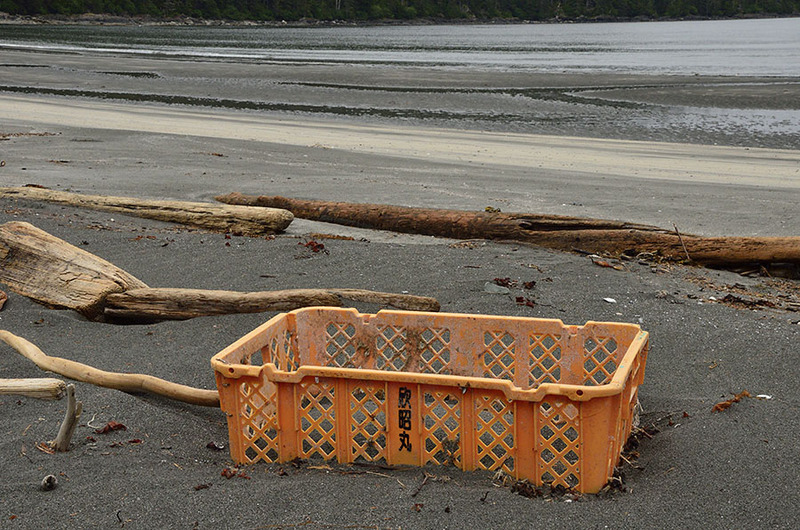 I wish everyone could see the horror of plastic trash spoiling a pristine, remote beach. We saw the same on the east side of many of the islands in the Exumas – so sad. Reduce-Reuse-Recycle. Bring your reusable bags when you shop. Please be mindful of the environment – every little bit helps. We had a beautiful day to head around Cape Decision, though some fog settled on the water with blue skies overhead for a while, clearing in time for us to see the lighthouse. Cape Decision was named during the explorations of Captain George Vancouver in 1793, along with many of the other islands and points in this part of the world. Cape Decision is where Captain Vancouver decided that he had traveled far enough north, beyond the islands claimed by Spanish explorers; today Cape Decision is a relatively narrow but important passage for ships traveling north and south in SE Alaska. We had beautiful conditions to cross open water to the southeast tip of Baranof Island, to the tiny town of Port Alexander. 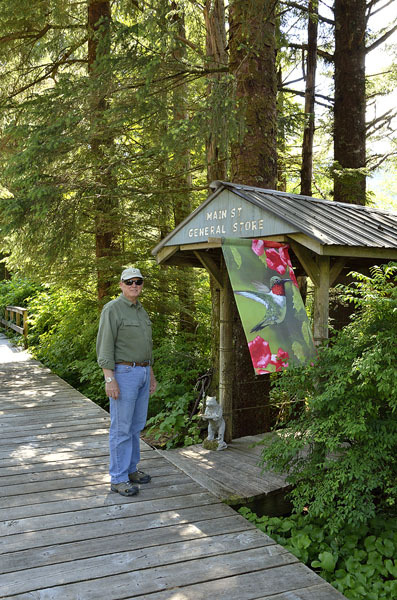 One of the floatplane pilots in Ketchikan used to live in Port Alexander and recommended that we check it out. We found an empty spot on the state dock to tie up so we could stretch our legs, walking the boardwalks that connect the scattering of homes and small buildings that make up most of the community. People were welcoming and friendly, and we were happy to find a tiny coffee shack/cafe where we could get some lunch. It’s always a treat to have a meal that we didn’t have to cook ourselves, no matter how simple. We sat with a local family, talking about school, life, and fishing. There are about 30 people that live in the community through the winter, which can be particularly hard since the harbor is open to the southeast where most of the winter storms come from. 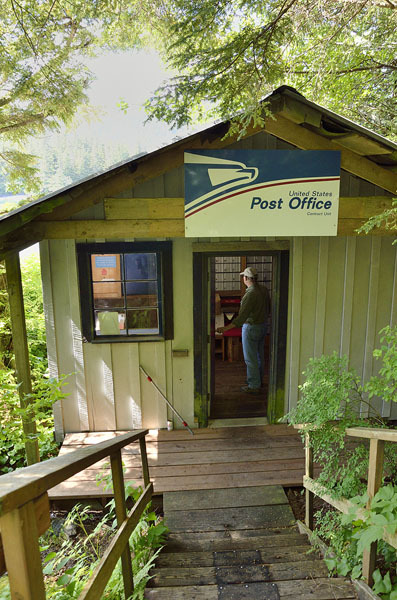 Boardwalks serve as the community’s streets, and there’s a school, tiny store, and post office. 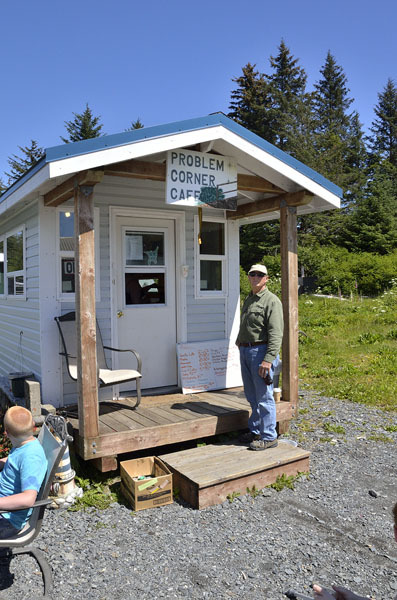 Just up from the coffee shop is a little wooden booth with a telephone in it – not a pay phone – just a regular phone, and a printed list of the phone numbers of everyone in town as well as some emergency and convenience numbers (Sitka hospital, seaplane service, etc.). 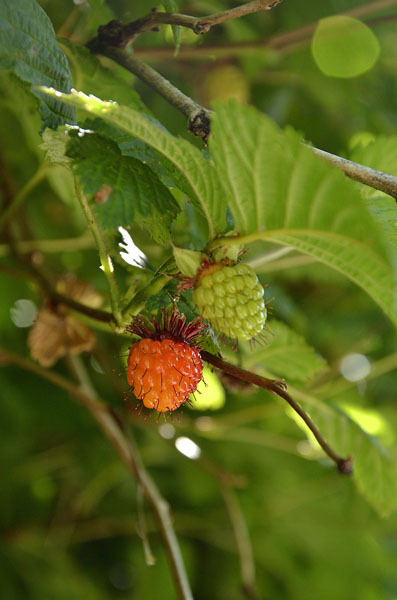 All along the boardwalk the berry bushes were full of berries in various stages of ripeness. 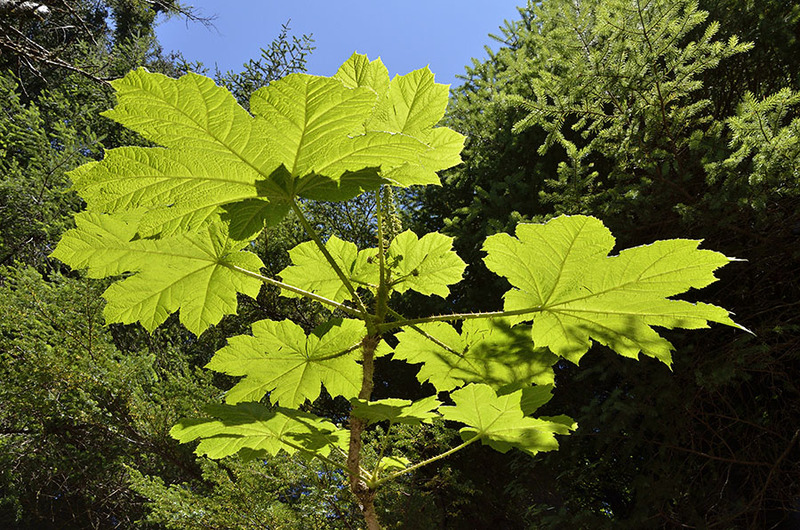 And there was plenty of cow parsnip and devil’s club – plants that are poisonous and thorny, so it wouldn’t be a good idea to venture off the boardwalk! We spoke to one lady who is a retired teacher, and she told us a bit about the school. Teachers come from the SE Alaska Island School District which serves many of these small remote communities, and they try to hire teachers with young children to help boost the population. There’s a newer school and gym, so the old school building is sometimes used as a dormitory for visiting teachers, or teachers who are new in town and haven’t settled in a house yet. 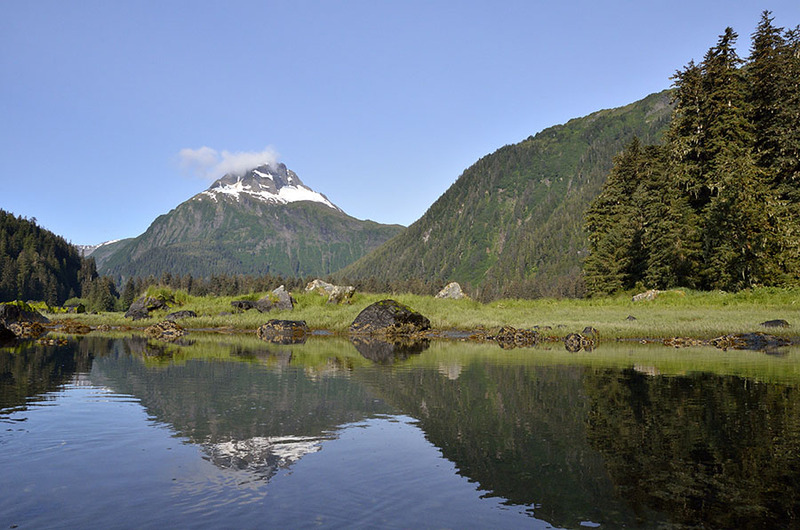 We enjoyed the walking and talking with people, but we had good weather to keep traveling so we left the next morning to continue up the east side of Baranof Island. The bay has a large outer basin and a large inner basin, with a tight squeeze between a large rock and a shallows from a landslide that separates the two. We had the inner basin all to ourselves for a couple of days, and we loved the quiet beauty and great weather. As soon as we were settled the kayak hit the water and I was off to explore. 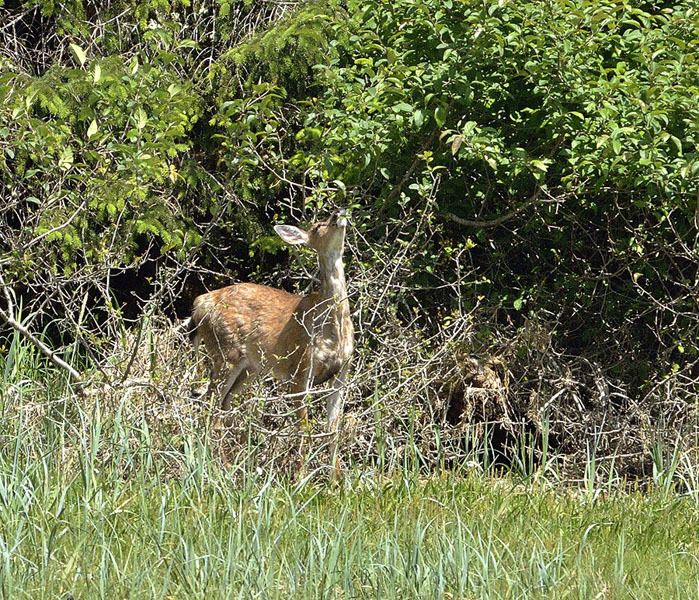 I saw a deer on shore, and as I was shooting some photographs of him, I heard a funny snorting noise nearby. 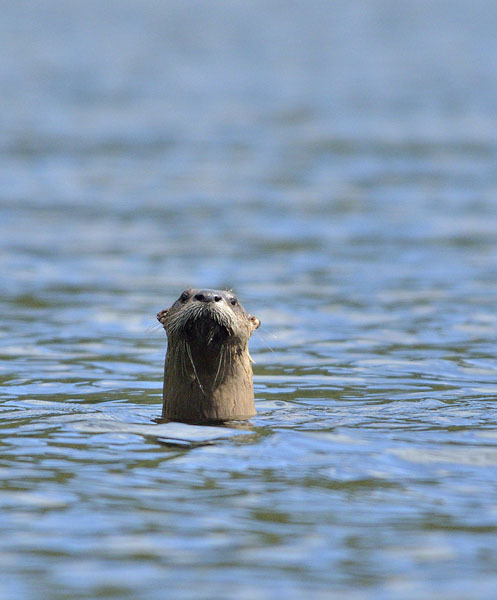 I looked around and heard the snorting again – it was a river otter. He was not too far away from me, giving me a stink-eye, and periodically snorting and making a huffing noise. I thought that maybe he was trying to draw me away from a den or young, so I kept drifting along (while the deer retreated into the woods)… but the otter kept up his snorting, rising up out of the water a bit with every snort. I continued my slow paddle along the shore while the otter shadowed me and snorted for about half an hour, even doing so with a fish in his mouth at one point. Very odd… but maybe the spirit of the devilfish is living in this otter! Fortunately we had a great time there, with no other unexplained experiences. The bay had a nice flat beach at low tide so Jim took his little quadcopter ashore to practice flying. This one is pretty tiny – a good one to practice learning to fly before graduating to something large enough to carry a GoPro camera later on. With only 7 minutes of flying time per battery practice didn’t last long enough, but not before he managed to fly it into the woods and we had to do a bit of looking. Jim recovered the drone with only a nick in one of the propellers, and now that we’re in civilization we’ve ordered a few more batteries for it. We left Devilfish Bay hoping to return again, but it was time to press on to new adventures. Cruising through the lower part of El Capitan Passage makes me think of a shattered windshield – that’s what the chart looks like with hundreds of little islands, nooks and crannies. It’s very rocky and beautiful. Although the area is very remote, there are a few pockets of homes in odd places. 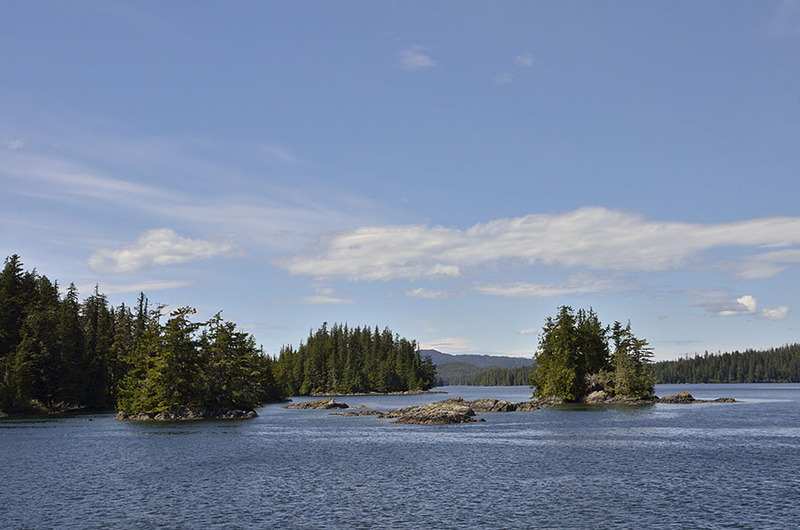 Prince of Wales Island has been logged much more than other islands in the region, and there are at least 200 miles of logging roads connecting the few villages and small towns to some of these little outpost communities. 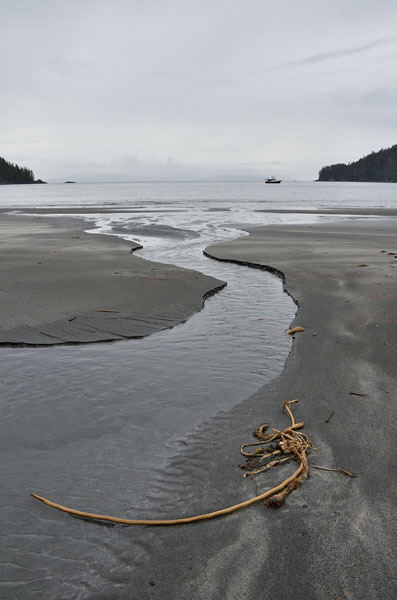 Sarkar Cove was our next anchorage, and it had a handful of houses and a fishing lodge – which seemed strange in such an isolated spot. We anchored near a creek that led to a lake, only accessible at high tide – at low tide it’s a rapids. 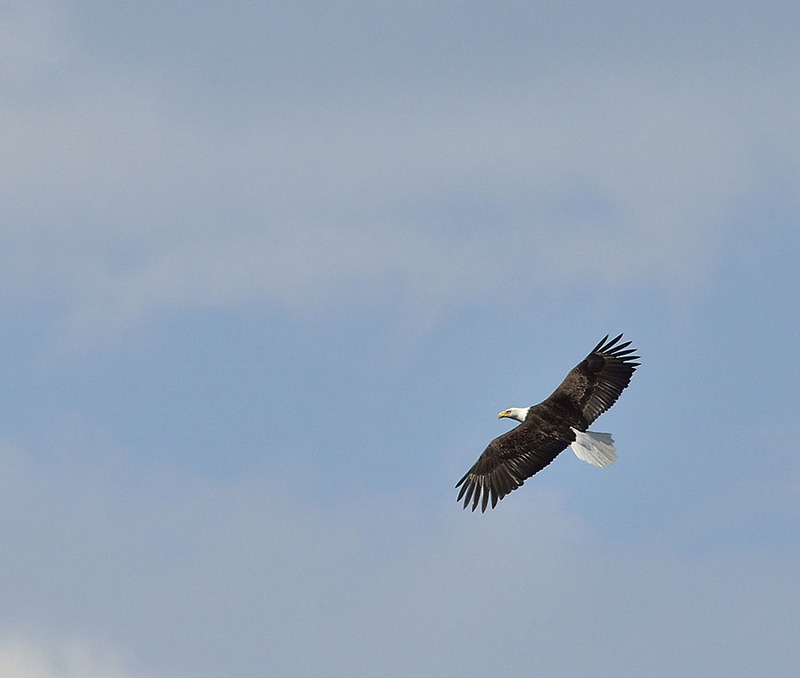 It was fun to sit in an eddy in the rapids with the kayak and watch the many eagles fishing and flying around. We took the dinghy over to see if we might be able to have dinner at the fishing lodge. The El Capitan Lodge is a beautiful facility, and the manager came out on the dock to welcome us and give us a little information about the place. 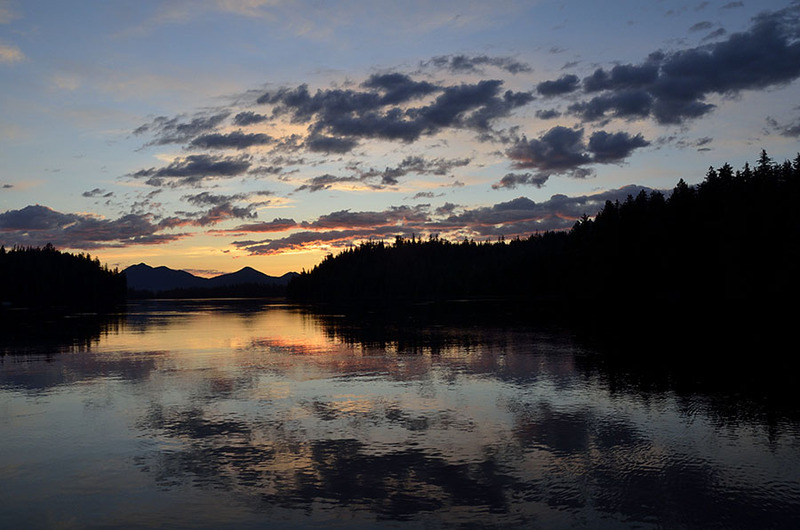 It’s a very active operation, with about 6-7 small boats, each with a captain and fishing guide that headed out with guests early every morning to try their luck at catching salmon and halibut. 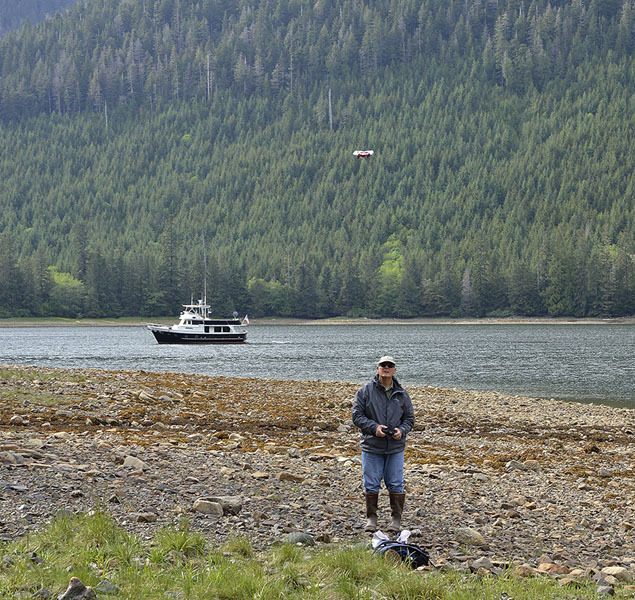 The lodge has their own float plane to ferry guests and supplies in, as well as a fish processing shed where each day’s catch is cleaned, vacuum packed, and flash frozen for the guests. Sadly they couldn’t accommodate us for dinner in their dining hall, but we were able to look around the property and appreciate the beautiful setting and well-maintained buildings. If anyone would like that kind of experience, we would highly recommend the El Capitan Lodge. Sitting closer to the open ocean (to the west) and on an island with smaller mountains, we were able to enjoy a rare sunset. In Petersburg the mountains around us are too tall to see the sunset; after spending so much time in the Florida Keys and Bahamas we’re used to seeing one every night, so seeing a sunset now is extra-special.